On the night of December 31st, 1987, I attended a New Year’s Eve party with my parents and my sister. The party was being held at the home of some friends of my parents. There was a fairly large number of people there. During the length of the party, the grownups were in both the living room and the family room, while a group of us kids were hanging out in the master bedroom. I recall that the windows in that bedroom had gold-colored vertical blinds, which looked somewhat gaudy and tacky. But, seeing those blinds would nonetheless inspire me (years later) to get silver/metallic vertical blinds for my own bedroom. There was also a big-screen tv set in that room. So, we spent most of the night just watching tv, flipping through the channels, and talking about various things. We saw part of the movie called Wildcats (starring Goldie Hawn). We also watched some of the music videos that were being shown on MTV. One of those videos happened to be for the song “Tell It to My Heart” by Taylor Dayne. And although all of us who were in the room had heard the song before, none of us had actually seen its video. So, we were somewhat surprised upon seeing what the singer looked like. With her over-the-top hairstyle and heavy makeup, she seemed almost like a bolder version of Madonna. And coincidentally, one part of the video featured the style of dancing known as "Vogueing”, which would go on to be popularized by Madonna’s "Vogue" song (and video) three years later. In fact, the “Tell It to My Heart” video was the first time that I ever saw anyone Vogueing. 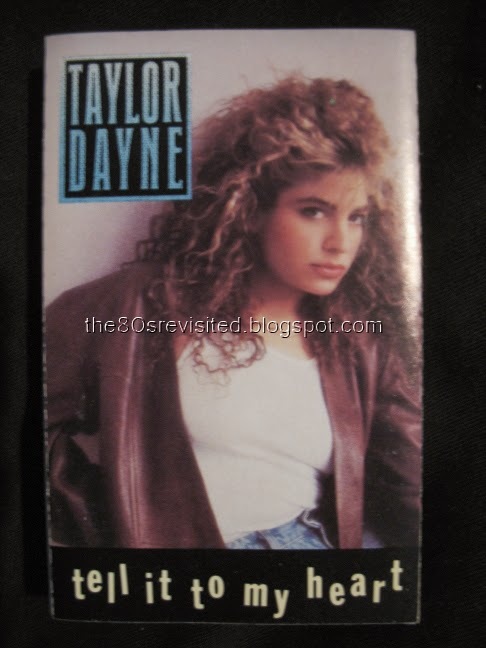 Months later, I bought Taylor’s first album (which was also titled “Tell It to My Heart”) in cassette tape format. I still have that cassette, all these years later. The song itself remains one of my all-time favorite songs. It's one of those songs that I must've listened to hundreds of times (perhaps thousands?) over the years. It's got catchy lyrics and an upbeat sound. There’s also a remixed/extended version to the song which I’ve always loved as well. I've included videos for both versions below, with the first video being the song's official video. Except where otherwise noted, the text of The 80s Revisited by AJ Mendez is licensed under a Creative Commons Attribution-NonCommercial 4.0 International License. on this blog, unless otherwise specified. please contact me at: the80srevisited@gmail.com Thank you.